Sharing a dorm with 4 other adults meant we pushed our comforters off of us within 10 minutes of laying down and slept only in our silk liners. Even with the window open and us closest to it, Laurie was uncomfortably warm all night. On the plus side, the beds have been comfortable everywhere we’ve stayed, so we felt rested when we woke up at 6:30am. We had hoped to leave at 7am but since that’s when breakfast was being served, we didn’t hit the trail until 8:15am. 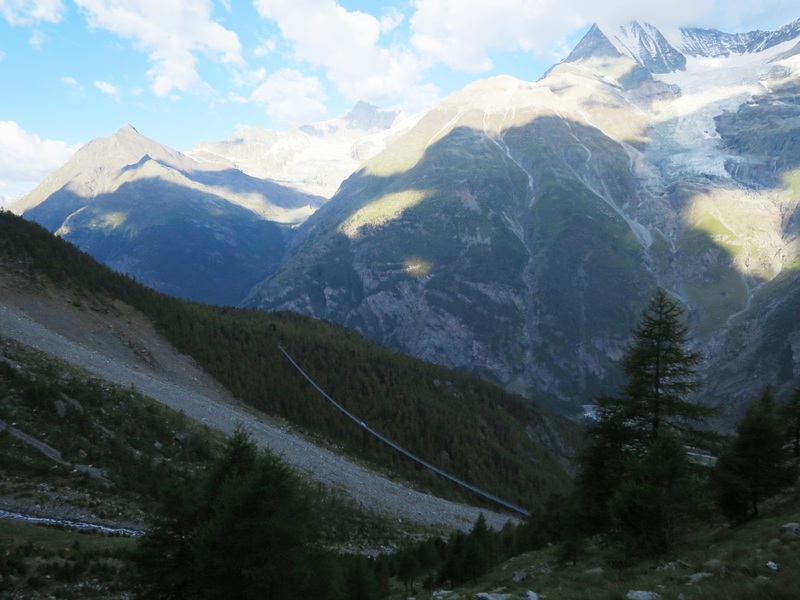 Under worryingly dark clouds, we left our last hut of the trip and descended toward a new bridge that bypasses an entire valley. A mere 5 days prior to our arrival, the 494 meter (1,620 foot) bridge opened, making it the longest pedestrian bridge in the world. It took us almost 7 minutes to cross it! 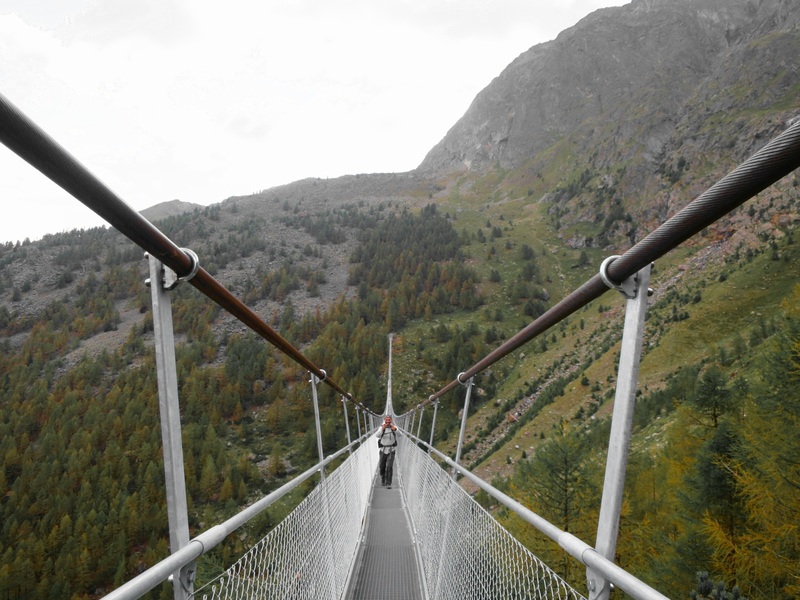 Being Swiss construction, it is incredibly stable and if you aren’t afraid of heights, totally safe. We were both expecting it to wobble about but even at its midpoint it was quite sturdy. This massivs bridge exists because the valley it crosses is notorious for rockfall that takes out the trail and previous bridges regularly. So the Swiss went big hoping it will be a permanent solution to an ongoing problem. 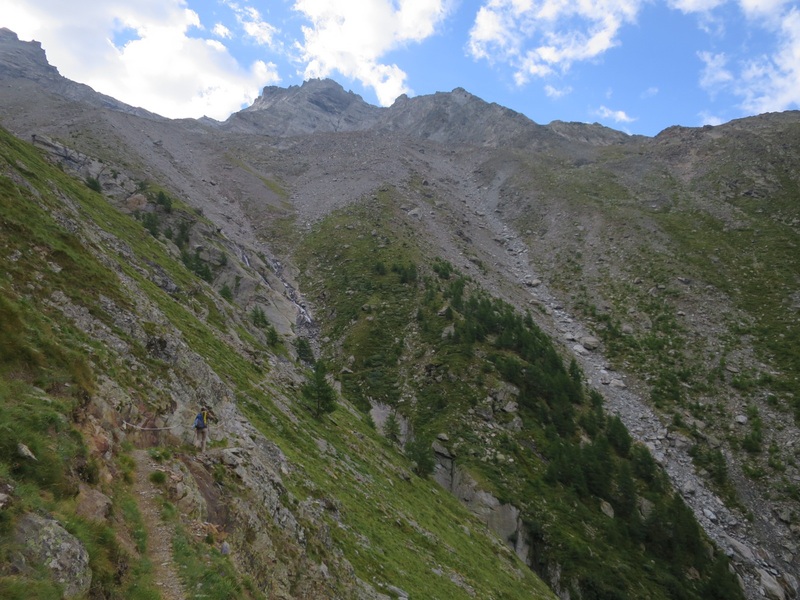 Our excitement for having crossed the new bridge wasn’t enough to offset the burn in our quads as the trail switchbacked up the forest and above treeline to meet up with the previous trail. 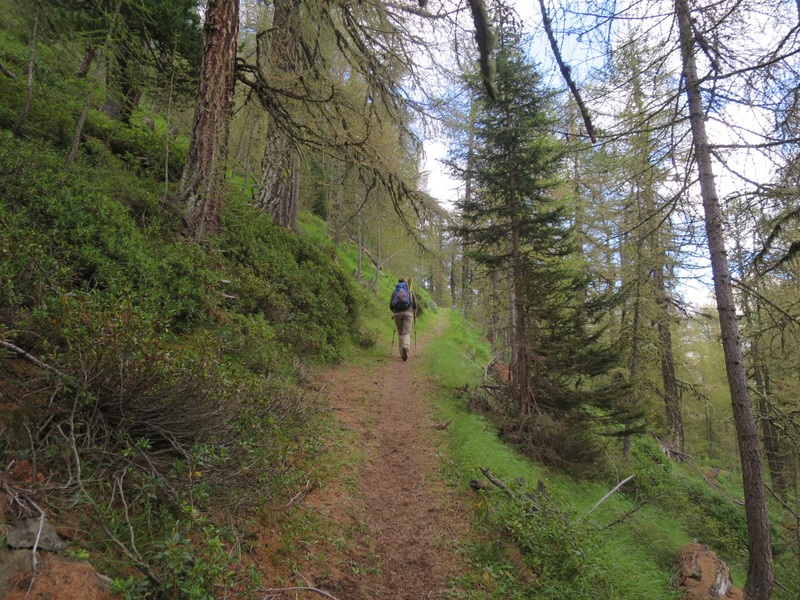 Along the way, Andy – as ever with his eyes wandering all over the place – spotted a chamois. 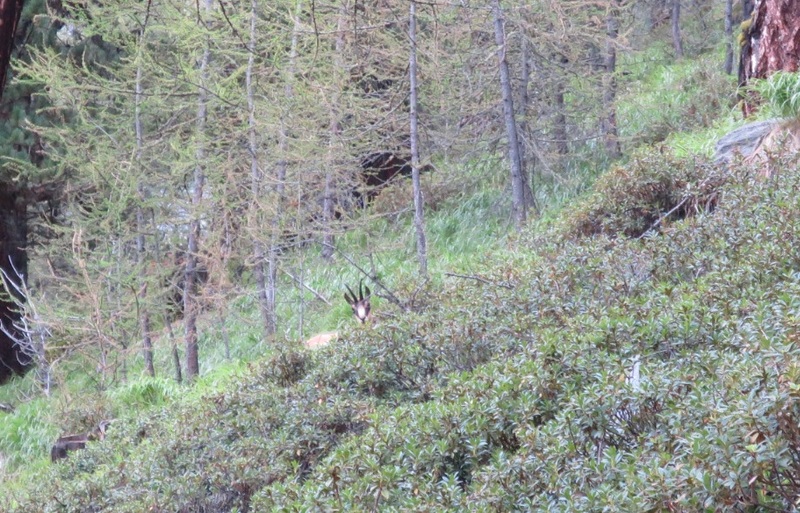 These goat-like creatures have been the hardest to spot on our trek through the Alps. They move quickly and even though this was the closest we’ve seen one, it was still at a distance too great to see clearly. 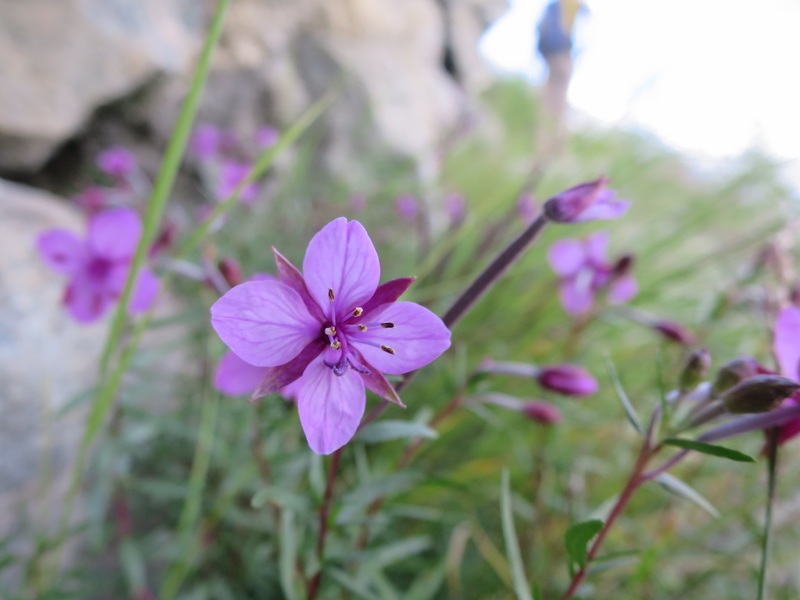 Once above treeline we continued our traverse through more valleys with even more surprises. Neither of us had read much about what to expect today, so we were quite surprised to turn a corner and find a tunnel blasted through the mountain in yet another notorious rockfall area. 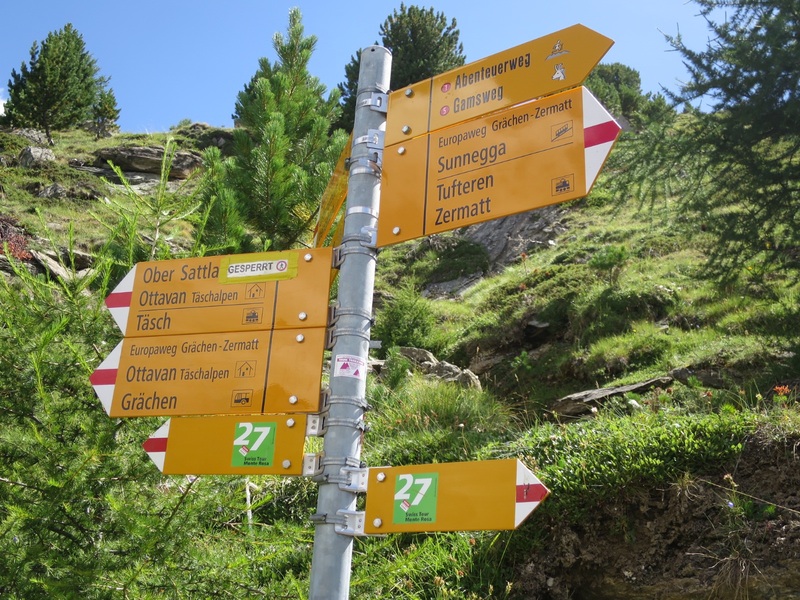 Once through, Laurie noticed a sign for hikers headed in the opposite direction warning them of falling rocks. “How come we didn’t have that warning sign?” Laurie asked. There wasn’t a lot of evelation gain today but when we did climb they were short and steep. 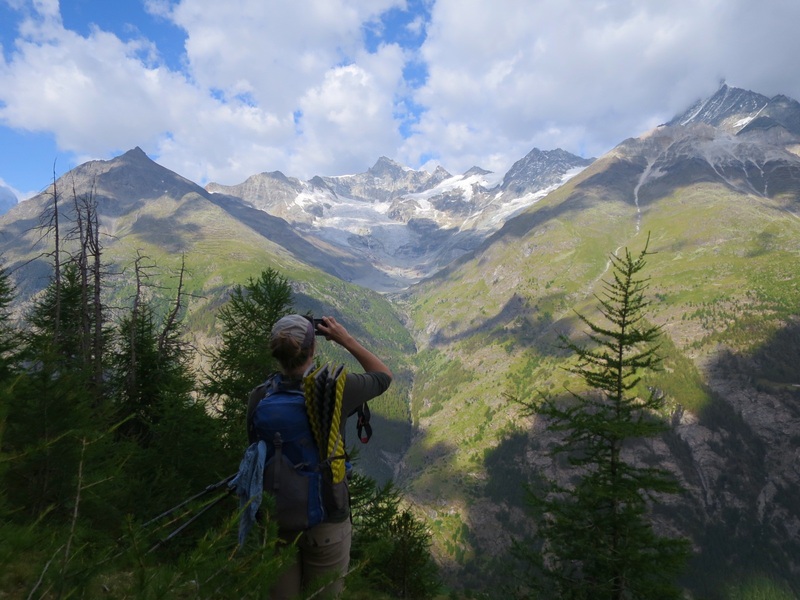 But as always, the climbs were worth it because we stayed above treeline for many miles and enjoyed tremendous views of mountains and glaciers. 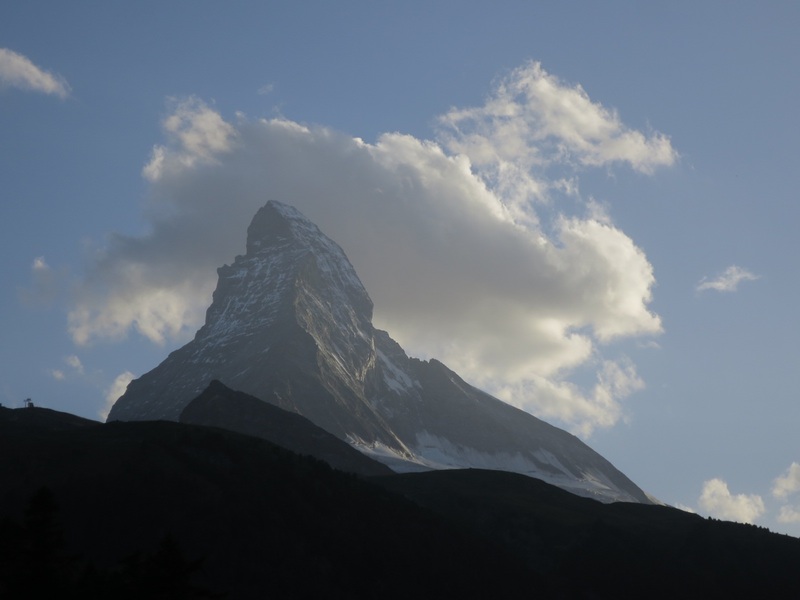 Unfortunately the Matterhorn remained shy all day, with its top third hiding in clouds. No matter though. The views were still enchanting. We turned another corner and guess what? Another rockfall prone area. 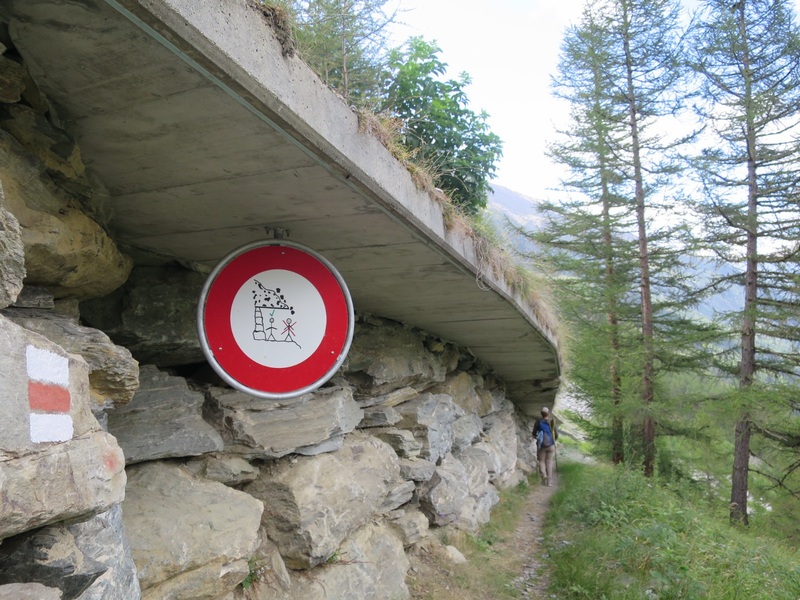 This has been such a problem that the Swiss have built concrete canopies and blasted tunnels to protect hikers. 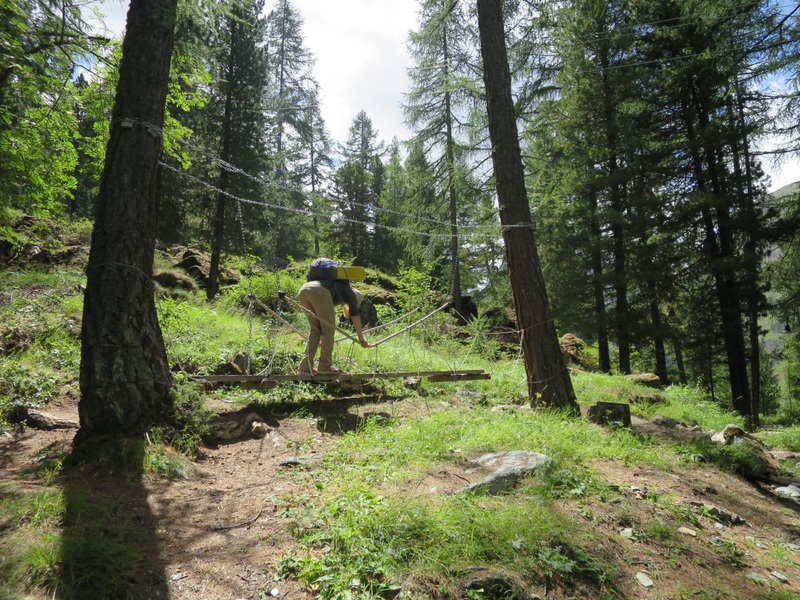 In some sections the canopies were breaking apart, undoubtedly from the weight of boulders crashing down on top of them. The canopies were at least a half a mile long, if not longer. We took a snack break under sunny skies, fantastic views of giant mountains and glaciers, contemplating whether to high tail it to town or take our time up high. The clouds were building and our Airbnb host had to be at work at 2pm. We didn’t want to wait until 7pm (when he got off work) to check in so we needed to be in Zermatt before then. But we also didn’t want to rush off the mountain and into 4 walls. So we decided to take our time with an eye on the clouds. 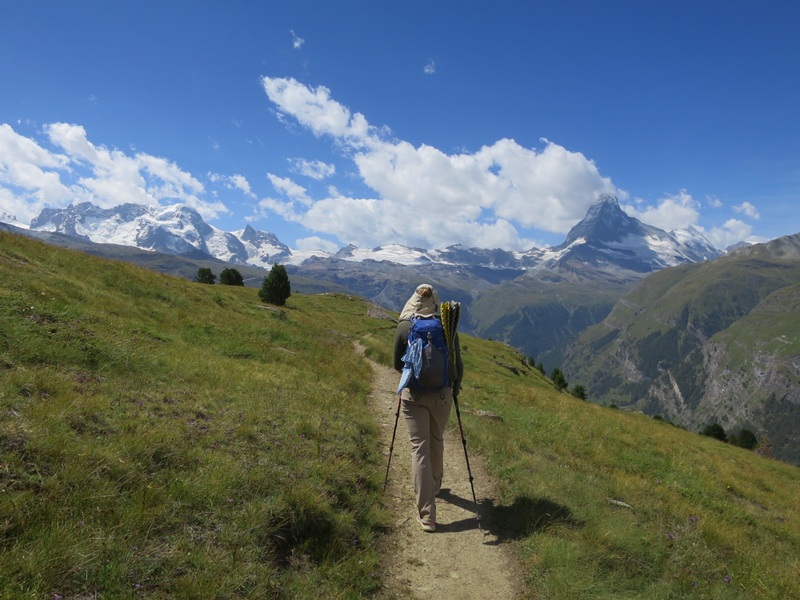 We casually descended into Zermatt, seeing more and more people with every foot of elevation we lost. 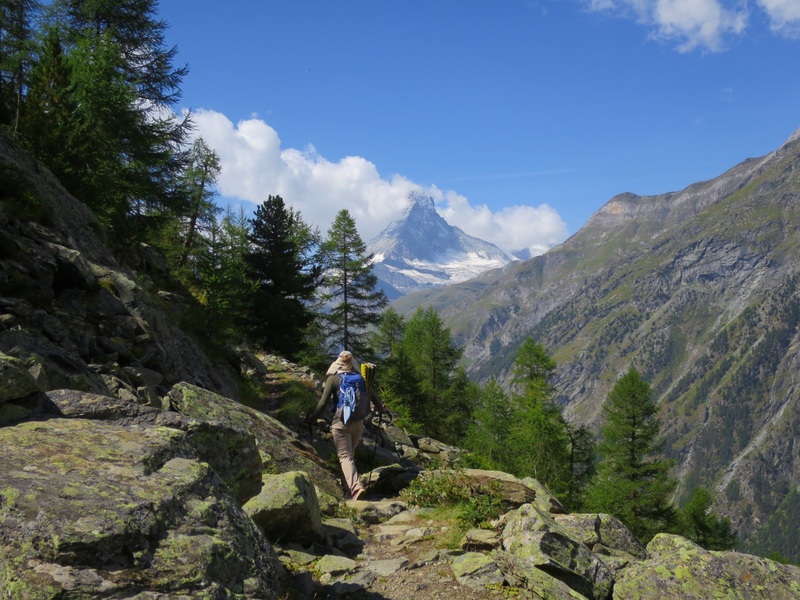 We’ve heard Zermatt is very expensive and quite touristy, so we wanted to stay in the mountains as much as possible. But we were also excited for fresh food and to walk through a town where cars are prohibited. After a never ending downhill we made it into the outskirts of Zermatt. Posh hotels and fancy homes all built to face the Matterhorn lined the streets. We made a plan to get our train tickets, meet our Airbnb host at his work to get keys, and shop for groceries so we can have tomorrow free for more adventure. Once in the center of town we had wished we’d stayed in the mountains longer. It was hot, there were tourists everywhere, cigarette smoke invaded our lungs and small electric vans whizzed by us at alarmingly fast speeds. And then there were the cyclists. Many locals use bicycles to get around, and when going downhill they ride way too quickly. No horns, no warning. Just a loud whoosh when they blast by. We stayed focused amidst the chaos, with Andy bowing cold air onto Laurie in a failed attempt at keeping her cool. We met Patrick at his work, picked up our keys and made a beeline for the supermarket. With quinoa, black beans, lentils, veggies, bratwurst, fruit and ice cream in hand, we began our walk through town, in search of home for the night. Not long into our urban adventure we decided to sit on a massive wave of a chair next to the river and devour our ice cream. The piercing sun was no match for the delicious vanilla ice cream. But the cigarette smoke from others in the vacinity did annoy us quite a bit. We sat for about 10 minutes, taking turns feeding one another while we watched hikers, mountaineers and tourists with selfie sticks walk past. Eventually we managed to roll off of the massive chair and continue walking. Andy carried the heavy grocery bag while Laurie guided us. With inconsistent street signage and hidden house numbers, we had a tough time initially finding the Airbnb. We walked up the hill only to turn around and walk back down again. 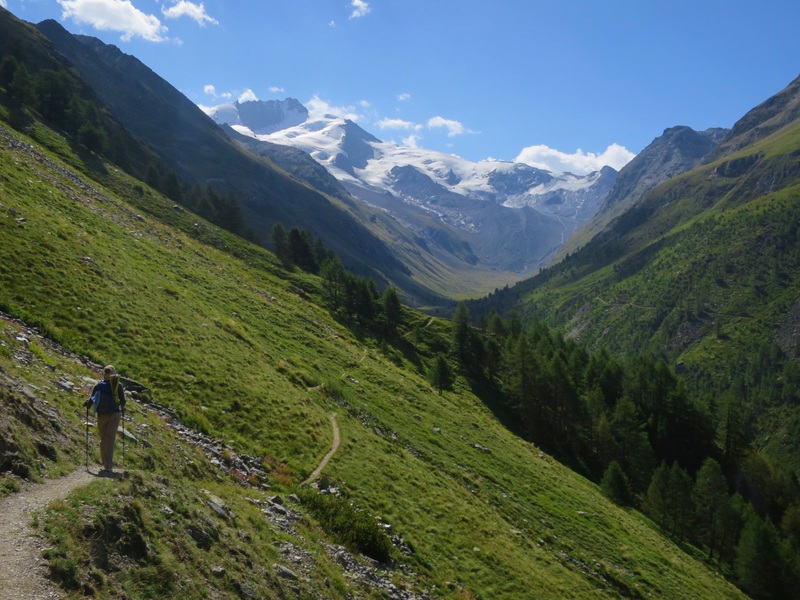 Eventually we found it, glad to be there and away from the hustle and bustle of Zermatt. We showered, cooked, ate and enjoyed views of the Matterhorn from the balcony. Around 730pm Patrick came home and we asked him about potential hikers for the next day. With a plan in place we retired to our room and fell asleep around 930, sad that our hike is over, but proud of our accomplishments. Tonight we are grateful for fresh vegetables and well stocked grocery stores. Chamois in the woods. They’re very quiet. Laurie on a mini ropes course. It was hilarious!